for the most part. It's pretty rare for me to say hey, I'de rather do burpees than anything else today because really, who says that? No one. No one says that, ever. But, 7 minutes of burpees was on the menu for me today and you know what? After the past few wods of double unders and ohs and power cleans and kettlebell swings, 7 mindless minutes of burpees sounded awe...err, OK today. I ended up with 65. Last year I think I got around 69 or so. This time I think my sore squat legs may have slowed me down. Guess that will happen when you do 30 back squats over bodyweight. Not that I'm bragging. Wow. Even spell check doesn't like the word burpee. My post is riddled with red squiggly underlines right now. I posted another recipe last night for the lamb burgers we made on Friday. They came out really well if I do say so myself. Actually Bob cooked them, but hey, I put all the stuff together. Team effort. I was too busy drinking tequila and singing Rock Band. Don't ask. OK, Sister Christian. There. I'm fasting today but I'll post a picture of my awesome eggs with grated sweet potato and leftover shredded beef I made the other day. Yes, it was as good as it looks. 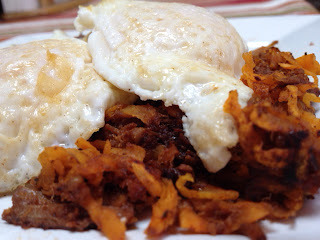 Grating a sweet potato and mixing it in with eggs is my new favorite thing right now. We eat a ton of them and sometimes you have to change it up. So I created a facebook page for my site. Iheartbaconandcrossfit. Go figure. I'm actually surprised it wasn't taken. And jesus christ, I forgot how annoying and time consuming it is to set up. Anyway I was thinking I may start focusing more on creating and posting my own recipes when I have time. Not that I don't do that already, I just don't always remember to write down or even measure amounts of ingredients I use since I usually fly by the seat of my pants when I'm cooking. Sometimes it works, sometimes not. I've always loved to cook so it's more of a matter of recording what I do.